The MTA's independent engineer warns that the subway construction's delays will have a significant impact on its opening date. UPPER EAST SIDE — The Second Avenue Subway won’t open in December if contractors can’t get it together, according to a new report by Kent Haggas, the MTA's independent engineer. A number of installations and tests should have been completed in June and still haven’t been done, putting the project behind even more than it already was in June. And with only five months until the planned December opening, these unresolved issues could pose "a significant risk to the project's completion” and mean a later opening date, the report states. Contractors met only 70 percent of project goals for June, which is less than the 80 percent they were said to have reached in May, according to Haggas. Much of the delay was in systems testing, the installation of police radios and other communication equipment in the stations, as well as a number of issues at the 72nd Street station, according to the report. Not installing the communications equipment on time "was the primary cause of the disappointing performance in June," Haggas wrote. Workers were supposed to have already completed wiring at the 72nd, 86th and 96th street stations for the communication system, but because they didn't, they now have to add more workers and shifts to get back on schedule. Mitchell Pally, an MTA board member, called out Judlau, the contractor for the 72nd Street station, during an MTACC presentation at a board meeting on Monday. "Let me get this straight. The stations contractor did not do his job and we are making the systems contractor do it?" he said. “I just want to make sure we’re keeping a financial track of who did what to whom." Scheduled tests on the subway's systems were at a slowdown, too — only 55 percent of the tests were completed by the end of June as opposed to 67 percent in May. The East 72nd Street station is also facing major issues — the installation and testing of one of the elevators there was set for Sept. 30, but is now set back a month to Oct. 30 because the elevator still has not been delivered. Other elevators are not on target to be installed on Sept. 1 as originally planned and will be placed instead by Sept. 30 because they haven't been delivered either, the report states. The testing of these elevators was supposed to be completed by Nov. 30 but that could be delayed, the engineer said. The MTA has already postponed the scheduled start of operations training for NYC Transit by 30 days to Oct. 1. Getting back on track means speeding up testing, finishing the installment of communication systems at each station, finishing last-minute changes to stations and system layouts and inspections need to be finalized, according to the engineer. Construction costs are at $32 million this month, down from $59 million in June, but an average of $46 million needs to be spent each month to meet the December 2016 deadline, the report recommended. To get back on track, Judlau has ordered more elevator cabs than what is needed to cover any other delays and contractors have agreed to overtime, said Kevin Ortiz, the MTA's spokesman. "We are monitoring progress on a daily basis," he said. 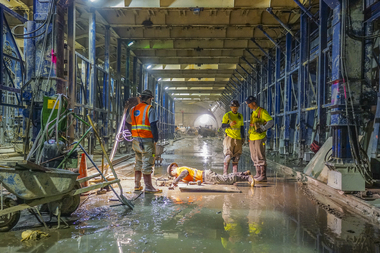 Construction of the $4.5 billion Second Avenue Subway project began in 2007 with the goal of connecting the Q line to the Lexington/63rd Street station, and to provide service from East 63rd to East 96th streets along Second Avenue.